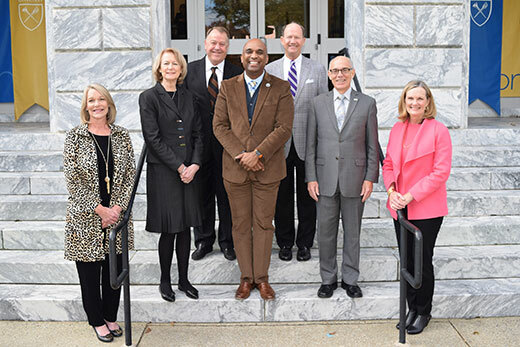 Front row - (L-R): Ray C. Anderson Foundation Trustee, Harriet A. Langford, University of Georgia Interim Provost Libby Morris, Emory Provost Dwight McBride, Georgia Tech Provost Rafael Bras, Ray C. Anderson Foundation Trustee, Mary Anne Lanier. Back row - (L-R) Ray C. Anderson Foundation Trustees Phil Langford and James A. Lanier, Jr. Emory, University of Georgia, and Georgia Tech are the founding partners of the Georgia Climate Project. The Georgia Climate Project is focusing on the practical risks and opportunities associated with a changing climate. “This partnership, which is generously supported by the Anderson Foundation, demonstrates the commitment of Georgia’s universities to the health and economic vitality of our state,” says University of Georgia Interim Provost Libby V. Morris. The Ray C. Anderson Foundation was created in honor of the late Ray C. Anderson (1934-2011), founder of Interface, Inc. During his time at Interface, Ray championed the notion of businesses doing well by doing good. It’s these noble qualities of advancing knowledge and innovation around environmental stewardship and sustainability that led to Ray’s recognition as a pioneer in industrial ecology. The purpose of the Foundation is to perpetuate these shared values and continue the legacy that Ray left behind.